Digital cameras are enabling us to monitor, remotely and at high temporal frequency, how warming and elevated CO2 treatments are shifting the seasons in a Boreal peatland forest. August 2015. From the Minneapolis airport, we drove north on Highway 169 for over three hours to the small town of Grand Rapids, founded in 1872 as a logging town on the banks of the Mississippi River. It was late August, and a fierce late-afternoon thunderstorm was brewing—a good time to stop for the night, especially given that we had already traveled more than 2000 km (1250 miles) that day. The next morning, skies were clear as we resumed our drive. After about 40 minutes, mostly down winding, sandy back roads, PhD student Morgan Furze and I had finally arrived at the Marcell Experimental Forest! Operated by the USDA Forest Service, the Marcell Experimental Forest is located at southern edge of the vast Boreal forest biome that stretches like a green band across northern North America, from Alaska to Newfoundland. Seasons here are extreme. Warm summers are offset by extremely cold winters, with the potential for temperatures below -40 degrees C (-40 degrees F) from December through February. This remote forested location is the site of the SPRUCE (Spruce and Peatland Responses Under Changing Environments) experiment funded by the US Department of Energy, constructed and operated by the Oak Ridge National Laboratory (ORNL) and operated in cooperation with USDA Forest Service and University scientists. Morgan and I followed a boardwalk which deposited us in the middle of the S1 Bog, a forested peatland where SPRUCE is located. I felt like I had arrived on the set of a sci-fi movie, or even at an alien landing site. The path wends among ten impressively futuristic enclosures, constructed of gleaming aluminum structural members and transparent acrylic glazing. Each enclosure is over 2 stories tall. Ductwork and blowers apply experimental treatments that warm the enclosures up to +9 degrees C (+16.2 degrees F) above ambient, and enrich the air with twice as much carbon dioxide as is in our atmosphere. Hidden electrical systems heat the subsurface peat. The hum of the equipment may distract you from the buzzing of ever-present mosquitoes. 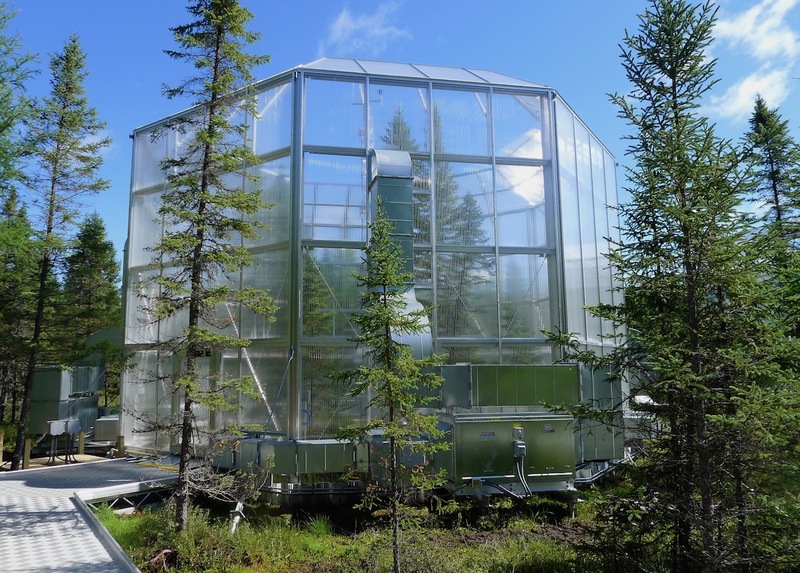 The 10-year experiment investigates how a wide range of possible future environmental conditions—warmer temperatures and higher CO2—will affect ecosystem processes and carbon storage in boreal peatlands. My group is collaborating on the project to study how the seasonal patterns of vegetation activity, or phenology, is affected by the warming and elevated CO2 treatments. I had first visited the SPRUCE site in the spring of 2012 at the suggestion of the experiment’s lead PI, ORNL’s Paul Hanson. At that time, the boardwalk hadn’t been constructed, and the enclosure design hadn’t been finalized. But Paul and I talked about his vision for the experiment, and we agreed that to really understand how the ecosystem responded to the experimental treatments, it would be ideal to add a phenological component to the study: phenology has been shown to be one of the most robust indicators of the biological impacts of climate change, and it regulates many aspects of how ecosystems work, including the length of the growing season. In keeping with the high-tech nature of the experiment, I proposed we use 21st century methods to track phenology at SPRUCE: for several years, I had been running the PhenoCam Network, which uses digital camera imagery, recorded every 30 minutes, to monitor vegetation “greenness” and how it varies seasonally, in a wide range of ecosystem types. This approach was going to be particularly appropriate here, given the remoteness of the SPRUCE site. With omniscient phenocams watching over the experiment, Paul and I could be “virtual visitors” to the experiment, at any time, any day of the year: the imagery we are collecting is all publicly available in real time through the PhenoCam Network data portal. It was a full three years before construction was completed and Paul was ready to flip the switch to turn on the above-ground warming treatments in August 2015. I had to hurry to Minnesota to get my phenocams in place! I was fortunate that John Latimer was available to help with the installation. John has been working as a technician at the SPRUCE project for several years. He is a retired mail carrier for the US Postal Service, chatty and outgoing, and something of a local celebrity in northern Minnesota: he has a weekly show all about phenology on the local public radio station (KAXE), and his enthusiasm for the “rhythm of the seasons” has inspired a fascination for nature in many listeners. As we worked, John and I had plenty to talk about: for 35 years, as he drove his mail truck along his daily 160-km (100 mile) rural route, he made careful observations and kept detailed notes on the weather and the phenology of plants and animals that he saw. 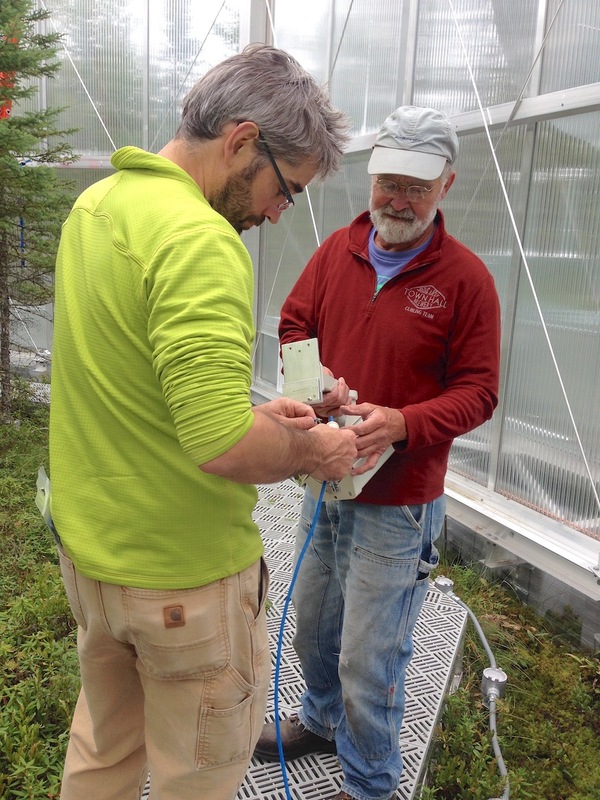 Installing a phenocam at SPRUCE, with assistance from John Latimer. Sample phenocam image from the SPRUCE experiment. Within five months of setting up the cameras, I realized that the warming treatments were already having a dramatic impact on vegetation phenology at SPRUCE, as autumn green-down was clearly delayed by warming. Over time, these results were corroborated by careful on-the-ground observations of vegetative and reproductive phenology by John and our colleagues Robert Nettles and Ryan Heiderman. Using data from more than two years of the experiment, our paper in Nature shows how SPRUCE’s experimental warming treatments resulted in an extension of the period of vegetation activity at both ends of the growing season. However, in the first year of the experiment a severe spring frost event caused extensive damage to foliage in the warmest chambers, because that foliage had prematurely lost its winter hardiness; in control treatments, vegetation was not damaged by the spring frost event despite temperatures dropping to nearly -15 degrees °C (5 degrees °F). These findings are captured by the wonderful illustration below. 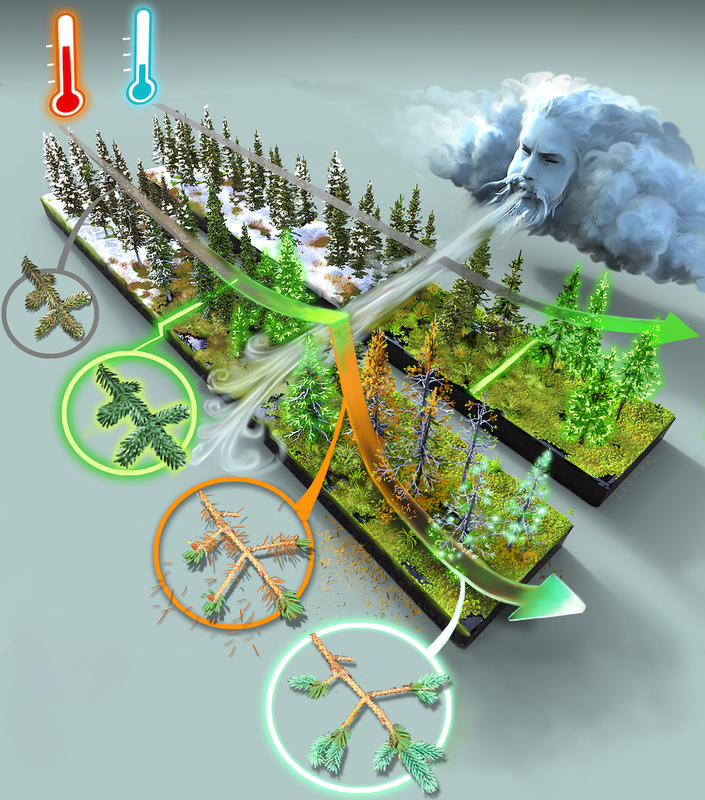 Artistic representation of the impact of SPRUCE warming treatments on phenology, and the severe impact of the spring frost in 2016. Illustration by Victor Leshyk. 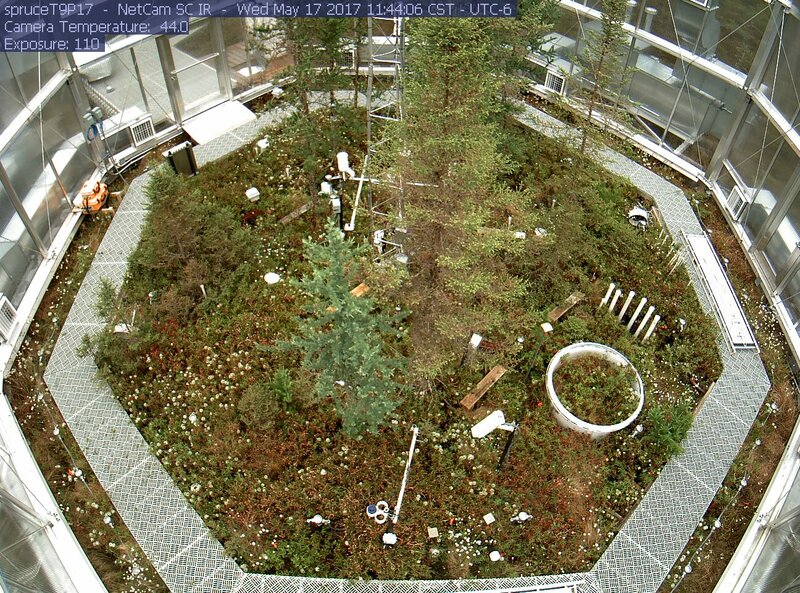 PhenoCam imagery is giving us a unique view of the overall trajectory of the SPRUCE experiment. My cameras have each recorded about 35,000 pictures since August 2015. With this imagery, I can travel, fast-forward, through the seasons, from winter to summer and back—all while sitting at my desk on the campus of Northern Arizona University in Flagstaff, Arizona. By comparing pictures from this year with pictures from previous years, I even see how much the trees are growing. And every once in a while when browsing the images, I’ll notice John, Ryan or Robert in the corner of a picture, which always makes me think I should get back up there for a visit.